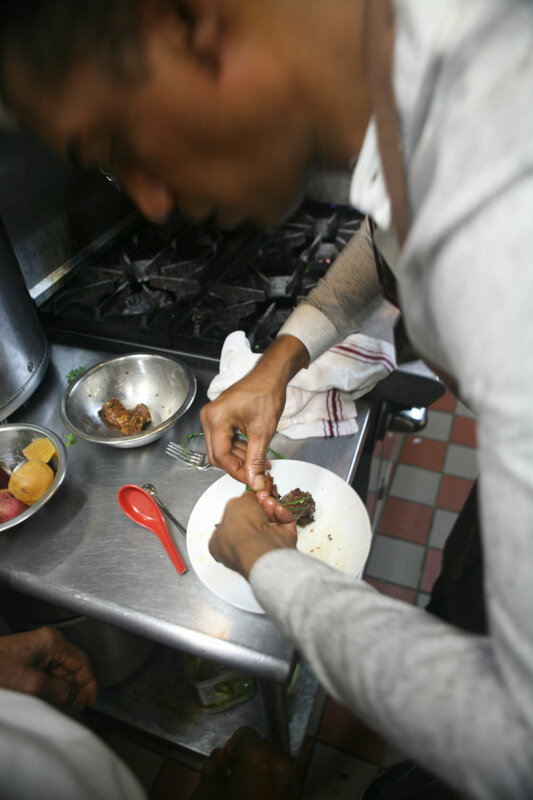 Back in early summer, in what could only be described as a jam-packed insanity of a day, we spent an intense afternoon with the flyest restaurateur, Sean John, chef and co-owner of Spur Tree, an 8 year old Caribbean restaurant located in the Lower East Side (LES) of Manhattan, NYC. We bounced a slew of questions off of Sean as he multi-tasked his way through kitchen prep, cooking an amazing meal, and preparing the restaurant for opening. He juggled all that and still found time to socialize with drop-in guests, such as friend, New York Knicks forward, Lance Thomas. As long time patrons of Spur Tree, and admirers of the growth of the restaurant, it was only natural for Niya and I to want to spend time with Sean to learn more about the guy behind the cool exterior - how he got from the tiny island of Jamaica to this point in his career. What unfolds is an interesting renaissance man of sorts destined to do great things. Sean's skills in the kitchen were first honed by his grandmother, in Mandeville, Jamaica, in an area known as Spur Tree. Thankfully for us, Grandma definitely set the foundation for his blended style of Caribbean cooking: a style which has subsequently evolved, influenced by his years spent traveling the world and living in various countries. After spending his formative years between Kingston and Mandeville, and working a gap year at a Sandals resort, Sean arrived in NYC in '94 to study film and geography. While in college, he worked in a restaurant and was further attracted to the dynamics of the business. Being the multi-focused personality, he also worked as an assistant editor for a magazine, spent a few years in the record industry, and utilized his photography skills with major organizations such as UNICEF. The pull towards the food business landed Sean as co-owner of Spur Tree in '08. This new found opportunity sparked a passion in him and ultimately fueled the turnaround and success of the restaurant. 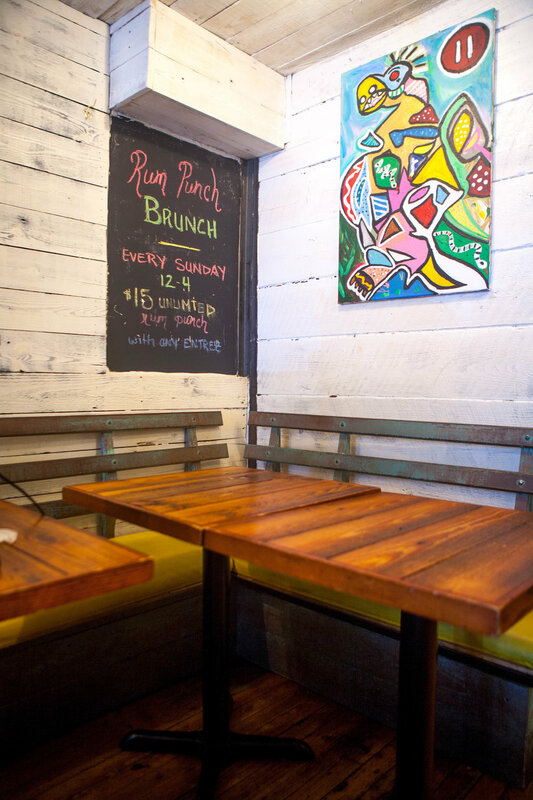 The idea of a Caribbean joint in the LES was met with a lot of naysayers and non-believers, but Sean felt it was right the moment. He noticed the cuisine was experiencing an uptick and wanted to get ahead of a possible new "trend". In an exciting move, Sean allowed the Caribbean menu to be influenced by the proximity to Chinatown and the limitation placed on the restaurant to only serve saki and beer. The result is a delectable mash up of the already complex Caribbean flavours and the stylings and restraint of Asian cooking. Interestingly, Sean is less inclined to refer to his style using the catchword fusion. As he rightfully points out, Caribbean cuisine developed from centuries of mixed cultures and regions, including the native Tainos, Africans, Asians and Europeans. You will see and taste the influences from these cultures in the various dishes found throughout the islands, from amazing oxtail stews, rich curries to boiled and fried dumplings. "Food is great, service is great and the vibe is great." - NY Knicks forward, Lance Thomas, on why he keeps coming back to Spur Tree. Lance readily became our official food taster, as we, the pescatarians, had to sit out the beautifully plated dish of jerked lamb with mint and tamarind sauce. Other dishes prepared for us were a summer salad featuring beets and blood oranges, and roasted purple potatoes with sautéed spring onions. After the first restaurant's closing due to a disagreement with the landloard, Sean took some time off to travel throughout Asia and Abu Dhabi exploring and developing his palate further and embracing more food concepts. When he returned to NYC, his second opportunity was but a step away. Spur Tree is now in its second LES home inside Norma's Cay, after operating for several years just next door. This new home is almost twice the size of the predecessor with an upstairs lounge area that overlooks the bar and restaurant and pushes out some amazing sounds on any given night via regularly rostered deejays. The airplane suspended above the patrons makes for quite the design impact while the bottles of liquor on display at the bar are a dead give away to the Caribbean roots. On his second go around, not only has Sean strengthened the brand by improving the menu and service, but he has also found a way to develop his own personal identity. He is modeling his brand after Anthony Bourdain, with multiple TV appearances, celebrity charity events, etc. "Restaurant business is challenging, you always have to come up with something different and constantly improve". With 8 years in, it seems he is the man for the task. "I care and love what I do", responding to our question on what he thinks makes Spur Tree successful. We asked Sean for his thoughts on changing technology and social media. "Focusing on one thing at a time is next to impossible these days." His first step to a more focused living: "I check email only once a day and that's after meditating first thing in the morning." He is now thinking of doing the same with the rest of his social media accounts. So what's in the works for Sean? As with any entrepreneur, he wants to take his business to the next level. Restaurant ownership will still be his thing, but he aims to be outside of the kitchen a lot more often. A well needed cookbook is also on the back burner. Furthermore, his eyes are set on potentially owning a hotel in Jamaica but in the meantime, Sean is currently investing his time in more television appearances and participating in a lot of celebrity charity events to build exposure. And it is paying off. We recently attended his #EATRED pop up bbq dinner event in Williamsburg, which included a great mix of people and the most delicious food! Best of luck to you Sean, we can't wait to see how your visions manifest.